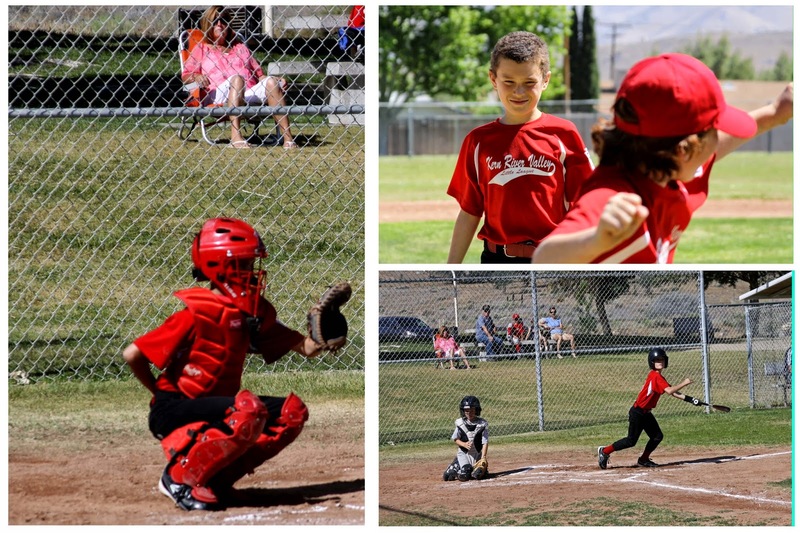 This is Will's first season of baseball, and he volunteered to be catcher. At first, I was like, "But honey, you can't catch!" However, the boy has improved by leaps and bounds. He is actually a pretty good catcher now, all things considered. Next year he moves up to the "majors" and will be catching with a real pitcher and not a pitching machine. His eye for the ball has developed, and he is hungry to tag someone out at home. Oh, and at his first game as catcher he just sat idly by, holding the other team's bat for them while the runner ran around the bases. He had no idea that home was his. Anyway, we all love to watch him play. I love the fact that it gives Ryan and Will a chance to hang out and do stuff they like to do together. Ryan is a good coach. My favorite thing about Little League so far is watching how much each boy has improved. We cheer so hard for that boy who struck out every practice and every game for the first month when he finally makes contact and gets on base. And the smile on their face when they do this is just too much for me to handle. It literally makes me so happy to see boys (anyone, really) practice and work hard and see progress. I love it. Ed wants to play next year. He's so goofy, it'll be interesting to see what he does. Case in point: he has been known to have harbored no less than 4 dead animals or animal parts in his pockets this month, and today he found a rock to bring home from school. The rock is the size of a basketball and weighs 40 pounds, but he said it might contain gold, so he brought it home.